This is THE Cathedral of Paris and one of the world's greatest structures. The present building replaced two Romanesque churches, which stood until 1160. Bishop Maurice de Sully began the current structure and work on it continued for more than 150 years. The result is definitely a Gothic Masterpiece. The details are exquisite. The grand ROSE WINDOW above the main portal forms a halo 31 feet in diameter around the head of the statue of the Virgin. The "flying buttresses" which support the walls are a fantastic architectural achievement. The exterior ornaments, especially the gargoyles around the ledges, are unequaled. These gargoyles also double as rainspouts. It's worthwhile to go to the top of one tower for the view, and later to walk around the church's exterior to the small park in back, where you'll have excellent views of the buttresses. Crusaders prayed here before leaving for the holy wars, Napoleon crowned himself emperor and Josephine empress here, and when Paris was liberated during World War 11, General de Gaulle rushed to the cathedral to give thanks. Construction of Notre-Dame started in 1163 when Pope Alexander III laid the cornerstone, and it was completed in the fourteenth century. Built in an age of illiteracy, the cathedral's exterior tells the stories of the Bible in its portals, statuary, and stained glass. Angry citizens pillaged Notre-Dame during the French Revolution. They mistook the religious statues above the portals on the west front for representations of kings and beheaded the figures. Nearly 100 years later, when Notre-Dame had been turned into a barn, writer Victor Hugo and other artists called attention to its dangerous state of disrepair, and architect Viollet-le-Duc began the much-needed restoration. He designed Notre-Dame's spire, a new feature. 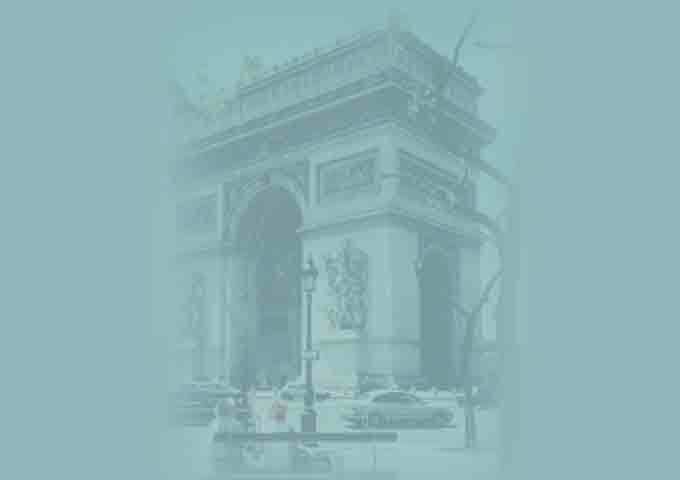 Baron Haussmann Napoleon III's urban planner) evicted the residents of the houses that cluttered the cathedral's vicinity and tore the buildings down to create better views of the cathedral. 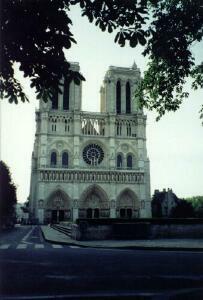 Today, the art of Notre-Dame continues to awe its hundreds of thousands of yearly visitors. The west front contains 28 statues representing the monarchs of Judea and Israel. The three portals depict, from left to right, the Coronation of the Virgin; the Last Judgment; and the Madonna and Child, surrounded by scenes of Mary's life. Before entering the cathedral, walk around to the east end of the church to appreciate the spectacular flying buttresses (the external side supports that give the massive interior a sense of weightlessness). The interior, with its slender, graceful columns and high, high ceilings, is impressive, with room for as many as 6,000 worshipers. Visit on a sunny morning to appreciate the giant rose endows--to the west, north, and south-- which retain some of their thirteenth-century stained glass. The blazing colors are a glory to behold on a sunny day. The cathedral's treasury, for which you must pay admission, is just that - a treasure trove of historical items from the cathedral, including gold and jeweled chalices and other objects used to celebrate masses, and robes and headdresses worn by archbishops. For a glimpse of Roman times through the nineteenth century on Ile de Ia Cite, head down into the Crypt Achéologique, the entrance of which is about 200 feet in front of the cathedral. The crypt is fairly new, discovered in the twentieth century by builders digging a parking garage.